Larry Hagman's ruby-adorned silver and gold belt buckle from "Dallas." A ruby-adorned silver and gold belt buckle from the U.S. television drama "Dallas" forms the centerpiece of an auction of personal items of late actor Larry Hagman, who played the conniving oilman J.R. Ewing on the hit series. 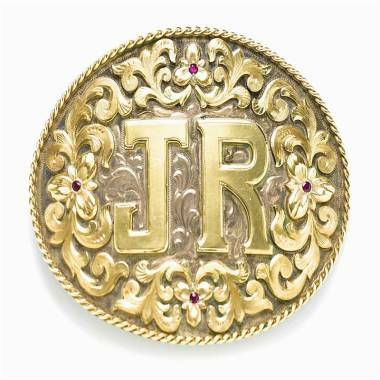 The buckle, with the initials "J.R.," is as garish and brazen as the character who wore it and is expected to fetch between $3,000 and $5,000 in a May 5 sale, Los Angeles auction house Bonhams said on Thursday. The large buckle has four rubies framing the initials of the villain on the show that was first broadcast between 1978 and 1991. Hagman, who reprised his role in an updated version of "Dallas" in 2012, died at the age of 81 in November from complications of throat cancer. He rose to fame in the mid-1960s as a star on the TV comedy "I Dream of Jeannie." Hagman's custom-made leather director's chair from "Dallas" is expected to fetch between $2,500 and $3,000, and dozens of cowboy hats owned by Hagman are expected to sell for hundreds of dollars each. Also up for sale among the scores of cowboy and Western-themed items is an abstract landscape painting by Welsh actor Anthony Hopkins, estimated to sell between $400 and $600.